This software synthesizer is a really extraordinary one! It's the name suggests it by hinting at the drink 'Absinth', which can cause halluzinations. Working with this Synth can lead one getting addicted in using it's inscrutable athmospheric, fat and endlessly morphable sounds, which are sometimes quite perverse (in the best sense!). The Absynth is a Synthesizer with a semi-modular architecture. Thanks to an extremely flexible envelope control, one can produce more than "only" sounds therewith. Morphing percussion-loops, physical-modelling-sounds and steadily changing sound landscapes are itself the result. One can form LFO waves with the mouse by drawing them. Absynth's semi-modular draft lets you easily combine subtractive sound analysis, amplitude-modulation, frequency-modulation and ringmodulation as well as waveshaping. Per voice, six oscillators, four filters, three ringmodulators, a waveshaper and a delay-processor stand to the decree - next to extensive graphic modulation possibilities. The LFO-waveforms can be drawn freely and shapes become as desired. That makes Absynth's LFOs especially simply and multilaterally. Absynth offers more than a dozen graphic envelopes with respectively up to 68 bases. The envelopes can be looped and retriggered in order to produce cyclic rhythms or never-itself-repeating sound movements. As the envelope-editor represents several envelopes among one another, its progresses can precisely be tuned on each other aswell as on a rhythmic screen. Absynth is a magnificent, avantgardistic synthesizer with brilliant sounds and GUI. The factory presets and also the innumerable user patches (to be found on the internet) indeed sound excellent, alien-like, 'intergallactic' and very impressing - but many of these complex sound worlds hardly can be integrated in a regular single mix . Absynth's most usesful purpose therefore is the 'standalone-application': for a sound designer, game- and filmsound producer. If one grudges no pains on getting aquainted with Absynth's brilliant sound morphing system, one will clearly realize what mighty kind of tool the Absynth represents! One can spend fascinating hours on exploring the wide range of possibilities given by the synth's oscillators; it's fascinating too drawing LFO-waveforms. Therewith one can produce simply spectacular sounds in comparison with other synthesizers, digitally and yet incredibly fat. Not very good: Absynth's audio engine is built as separate module; on activating the Absynth in an audio instrument track, e.g. 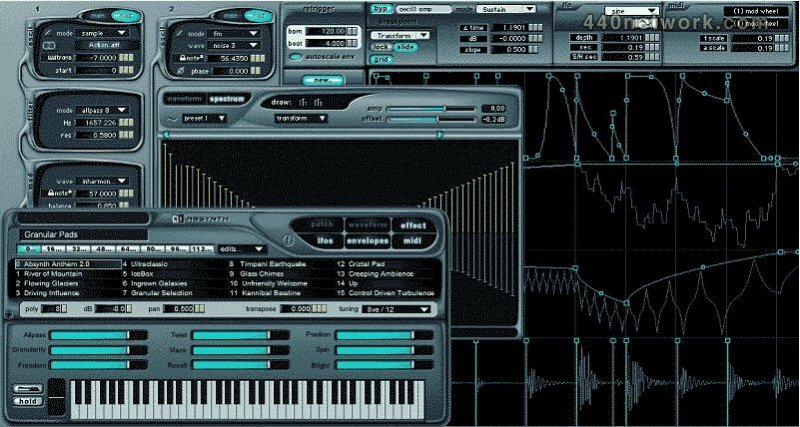 in Logic's environment, itself opens in the background of the host software once again with the same Synth GUI and the full graphic editors that we know from the standalone version. Would it not have been possible (like in the FM7) to integrate this in the VST version? A little facilitation in the matter of switching forward and backward offers the link button in the editor: by clicking it shifts immediately to the VST. A further disadvantage: if one quickly shifts through a couple of sound banks in the presetselection and in addition to that one opens further audio instrument tracks with Absynth instances, the VST presets always stay related to the presently loaded presets of the external host editor. That means that you have to assemble a soundbank for a new project per import preset function. On doing that you waste a lot of time, especially by loading presets of dozens of banks.